Fresh green beans are so delicious! Once you’ve had them, it’s hard to go back to canned green beans – and certainly not store-bought ones! The trick is boiling them for a few minutes, and then giving them an icy cold bath (also called “blanching”) to keep them from continuing to cook. Boil water in a heavy saucepan. Add green beans and cook for 2-3 minutes. Drain beans in a colander and place the colander in a large bowl that has been filled with ice and cold water. Be sure that all green beans begin to cool down immediately. Heat olive oil a skillet over medium high heat. Add garlic and saute till slightly brown. 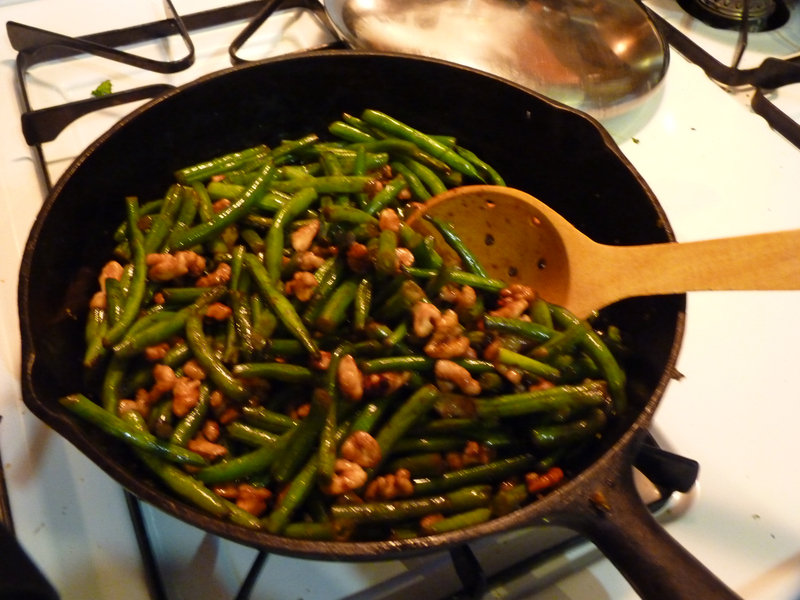 Add green beans and walnuts and continue cooking until beans are warm and crisp – 5-7 minutes. Salt and pepper to taste.